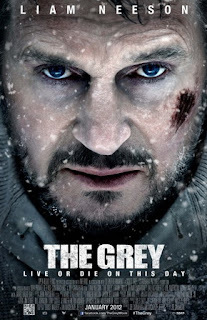 Director Joe Carnahan (THE A-TEAM) again summons the Olympian screen presence of Liam Neeson for epic (but existential) THE GREY, a masterful Man vs. Nature thriller that’d make tough guy authors like Ernest Hemmingway (The Old Man and the Sea) and Jack London (White Fang, Call of the Wild) proud as peacocks. Neeson is Ottway, a sharpshooter employed by an oil company to keep lions, tigers, and bears from turning its Alaskan riggers into Lunchables. His assignment is done, so he’s headed home (wherever that is) in bad weather on a plane filled with other societal outcasts like himself: hardworking but profane drifters, felons, and loners. The movie trailer reveals that their rickety craft is swatted from the sky into some cold corner of the Pacific Northwest that time forgot. What it doesn’t fully reveal—but suggests—is Carnahan’s skill at wringing the pathos out of the survivors as they brave the challenges of the snowy wilderness. Unsurprisingly, Ottway stumbles from the wreckage (thanks to a last-minute seating change) and discovers the leader within reawakened. In a scene that plays like visual poetry, he comforts a fatally wounded man, then rallies the others at the crash site despite the fact that he was ready to kill himself just hours earlier. For while Ottway suffers no injuries in the harrowing crash, he’d boarded the plane broken-hearted and despondent. Lacking fresh-dead Tauntauns to crawl inside for warmth, the men huddle in the fuselage and ponder their next move, starting fires with siphoned jet fuel and looking to Liam for a little Qui-Gonnly advice. And come the wolves do, the Alpha male sending his Omegas to test the human interlopers. We’ve all seen the Irwin Allen and Roland Emmerich blockbusters, so we’re prepared to watch the cast succumb one by one--mauled by the wolf pack, frozen in a blizzard or drowned in a creek. Thankfully, Carnahan really runs the faucet on the characters, exorcising each man’s personal demons before draining him of life. The wallets of the slain are collected, their billfolds becoming talismans for those who remain. Talget (Dermot Mulroney) and Burke (Nonso Anozie) brave hypothermia, exhaustion, and despair while Ottway and Diaz have a philosophical debate about the utility of Fear. Hendrick (Dallas Roberts) makes a John Rambo cliff jump to access a river that might lead to civilization, but even then the guys are unsure whether they’re heading away from wolf territory or deeper into it. Marc Streitenfeld’s score propels the action vigorously, if sometimes noisily. A frequent collaborator of Ridley Scott (who produces here), the German composer uses slithery strings, percolating percussion, and bleating brass to augment both the physical and psychological turmoil. The music is effective, if a little too loud in spots where Carnahan tries to catch us off-guard with a quick cut (as in a sudden attack on one unsuspecting character who goes off alone for a pee break). Masanobu Takayanagi’s cinematography is eloquent and haunting, the predominant color palette (referenced in the title) of charcoal grey and mottled whites echoing the spiritual darkness the men traverse. Diaz doubts God favors them (if he even exists) and suggests during a fireside chat that nothing awaits them beyond this world should they perish. The soft-spoken Henriksen believes providence has thrust them together—but Ottway too has misgivings. 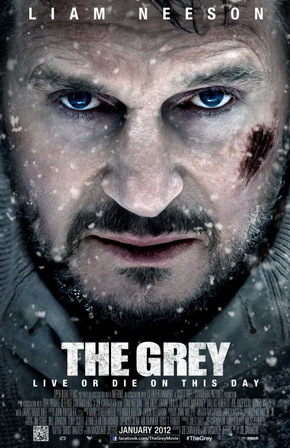 The climax finds Neeson’s emboldened outdoorsman going absolutely Ahab in a brilliant shake-your-fist-at-the-sky moment that’ll be impossible for the Academy to ignore this time next year. Watching THE GREY’s animal adversaries, I found it hard to tell if (or when) I was looking at authentic wolves, CGI beasties, or animatronic puppets. Which is another way of saying they’re convincing enough, however rendered. The wolves look, sound, and feel like a real, visceral threat. And their violence is as bloody as it needs to be; there aren’t many ways to soften the gruesomeness of an attack by these ravenous predators. The picture earns its R rating for blood-and-guts as well as coarse language—but Carnahan capitalizes on opportunities to turn gore into beauty, focusing on crimson paw prints icing over on the ground rather than some poor rigger’s shredded face. And THE GREY isn’t completely devoid of humor; the men joke about whether they’re turn into wolfmen if bitten, and if they’re going to have to resort to snacking on each other’s butts, as in the 1993 survival classic ALIVE. Some will quarrel over the film’s abrupt ending, but given the overarching themes itreally shouldn’t come as too much of a shock. 3 ½ out of 4 stars. It should have been called wolf Puncher the puncher of Wolves. That's a title that pops.